Each week, Your News to Know brings you breaking news about the overall economy and the market of gold and other precious metals. This week’s stories include: Peter Schiff believes that this is the last window of opportunity to exchange overvalued dollars for gold … gold goes up on reports of central banks looking to expand gold reserves … and U.S. gold production down 11 percent in August. Gold reached a two-week high on Tuesday, nearing close to the key $1,200 per ounce level as some media reports suggested that the Russian and European central banks were considering the possibility of expanding their gold reserves. Yves Mersch, a member of the European Central Bank (ECB) executive board, said the acquisition of hard assets such as physical gold was “theoretically” an option for the central bank. The gains in gold are a “quiet signal of people revising expectations of outlook for U.S. policy,” BNY Mellon’s Simon Derrick said on CNBC. There’s also the possibility of India’s central bank imposing a curb on gold imports, and since India is the world’s second-biggest gold consumer, that could put additional pressure on the yellow metal’s prices. 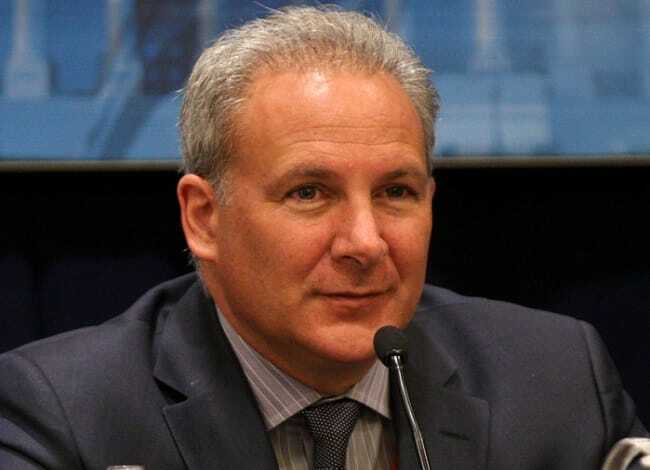 People should take advantage of this last window of opportunity to buy gold at a bargain and sell their overvalued dollars, CEO of Euro Pacific Capital Peter Schiff told Kitco News on Tuesday. Schiff also shared his thoughts on the Tuesday reports about Russian and European central banks looking at gold. In his view, central bankers are doing the right thing since the price of gold is about to spike. “A lot of people thought, when gold was falling that Russia was selling […] Putin is way too smart to sell his gold. If anything he’s buying gold and selling dollars,” he said. U.S. mines produced 591,573 troy ounces of gold in August this year, a decline of 11 percent from August last year when mines had 665,520 ounces of gold output, according to a Monday report by the U.S. Geological Survey (USGS). In August 2014, the average daily gold production of U.S. mines was 19,033 ounces. For the first eight months of this year, total U.S. gold production accounted for 4,501,104 ounces, while exports of refined bullion, gold ore and concentrates, and doré bars and precipitates added up to 9,355,867 ounces, according to USGS. We share even more stories on gold throughout the week. Follow us on Twitter to stay up to date with the latest news.